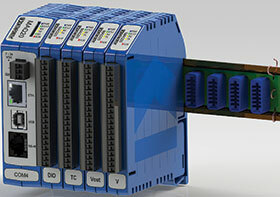 The Dataforth MAQ20 industrial data acquisition and control system from Elexsys consists of DIN rail-mounted, programmable, multichannel, industrially rugged signal conditioning input and output modules. Visit Stand D13 to find out more about its many features. These include 1500 Vrms channel-to-bus isolation; 240 Vrms I/O protection; integral PID control, alarms, counters, timers and PWMs; and an interface to voltage and current sources, thermocouples, strain gauges, potentiometers, RTD and frequency inputs.